- By Srinivas Nidumolu, Head-Product Development, CASHe. Payments and lending is a constantly evolving landscape. The recent demonization of INR 500 and 1000 was a shock to the public, what wasn’t a shock was how smoothly millennials and the older generation are able to make the switch to function without cash. In fact, CASHe has also transformed the way people take short term personal loans through our quick loan app. Now, instead of dealing with paperwork and waiting in banks, customers can swiftly get a short term instant loan (15 days, 30 days, 90 days) for personal needs. The CASHe loan app uses efficient social lending scoring algorithms to decide on the fly if the customer is worthy of a loan or not. Here are some other ways the payment landscape is changing in India Unified Payments Interface (UPI) Launched by NPCI this year, UPI is a rather big accomplishment for RBI, especially because it simplifies and unifies the online money transfer process. With UPI, users no longer need cumbersome information like account number, bank holder’s name, and IFSC codes. Instead they only need a virtual ID (Ex. johndoe@xyzbank which customer sets up via the UPI participating bank) or as simply as via Aadhar number to send payments from their phone directly. UPI also supports pull and push type of payment requests. Many participating banks have launched UPI apps, and underlying UPI, the payments are made through IMPS, so the amount is instantly transferred without any delays. 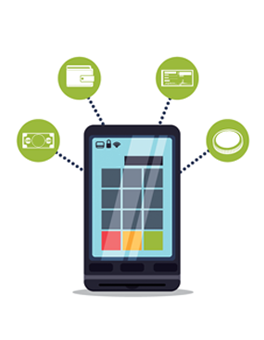 Digital Wallets Trendsetters in digital wallets like Android Pay, Apple Pay have helped kick start a plethora of digital wallets in India. 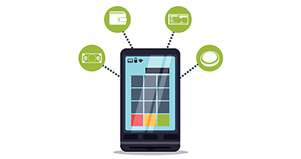 Digital wallets are quickly gaining ground all around the world for the convenience and safety they offer. Instant Money Transfer (IMT) Customer can transfer money simply by entering the beneficiary's mobile number and a sender code. The beneficiary will receive a 15 digit IMT ID and a 4 digit SMS code. The beneficiary can use the sending bank's ATM to make a card less withdrawal of the amount by entering the IMT ID and code. IMT has not fully caught up as not all major banks are offering the service. Also IMT offering banks have daily and monthly caps on money transfer and withdrawal. Also some banks want the beneficiary to register with them if he isn't a customer already. Right now SBI and Axis bank are some of the banks offering this service. Cryptocurrencies Cryptocurrencies like Bitcoins and Litecoins have an underlying block chain ecosystem which is a distributed ledger that works on a peer-to-peer network and accounts for the transactions. Bitcoins is probably one of the most popular cryptocurrencies out there, and users prefer it because it’s fast, secure, and borderless. Not to mention, the total number of Bitcoins is fixed at just below 21 million coins and cryptocurrencies in circulation cannot be artificially increased by printing money like other physical currencies. Aadhar payments (APB and APS) Aadhar Payment Bridge (APB) helps make payments directly to the Aadhar enabled bank accounts of people who are in need of social schemes. With Aadhar Payment System (APS) anyone can provide their Aadhar number and fingerprints at a microATM to avail financial services. While the authentication is done by UIDAI, the financial transactions are handled by NPCI. Final Words With the introduction of 4G, fiber optic internet, and advanced smartphones, the payment landscape in India is truly changing as the customers shift more towards online payments and rely less on cash. In fact, it has been predicted that non-cash payments which constitute 22 percent of all consumer payments right now will overtake cash transactions by 2023. With the current quasi demonetization drive who knows we might reach there faster! How to get a personal Loan? What is Instant Personal Loan? Why choose App only Loans? How to apply for loan on quick loan app? Looking for an online Loan App? What is the process to apply for Personal Loan? What are the types of Instant Personal Loan? What is tenure of Short Term Personal Loans? What is the eligibility criteria for Personal Loan? Personal Loan vs Gold Loan: Which is better? BHANIX FINANCE AND INVESTMENT LTD. A 100% GROUP OWNED SUBSIDIARY.